You can now make countless Dynamic Door variations by combining FlexDoor with a freely available dynamic component by the great DC developer pcmoor. In order for this combination to work (without the typical DC bug of components flying all over the place), we've developed a new tool - Make Totally Unique. This tool does what it says, it makes a component unique including all of it's sub-components. So when you go around making copies of these combined doors, if by any chance there is a DC sub-component that isn't sure about it's new identity and where it should belong... now it will know! 3. Set FlexDoor's door panel width to 3.81cm or 1.5". 4. Place and scale the new door panel so it fits exactly with FlexDoor's door panel. 5. Cut (CTRL + X). 6. Double click your way into FlexDoor until you reach a component called: doorClearPanel. 7. Right Click > Scale Definition. 8. Delete or hide the geometry that is inside doorClearPanel. 9. Paste In Place. The new door panel is now combined into FlexDoor. 1. Make a copy of the newly combined door. 2. Make the new copy Totally Unique with the new 'Make Totally Unique' tool. 3. Select the dynamic panel. 4. Select one of 45 door panel presets. 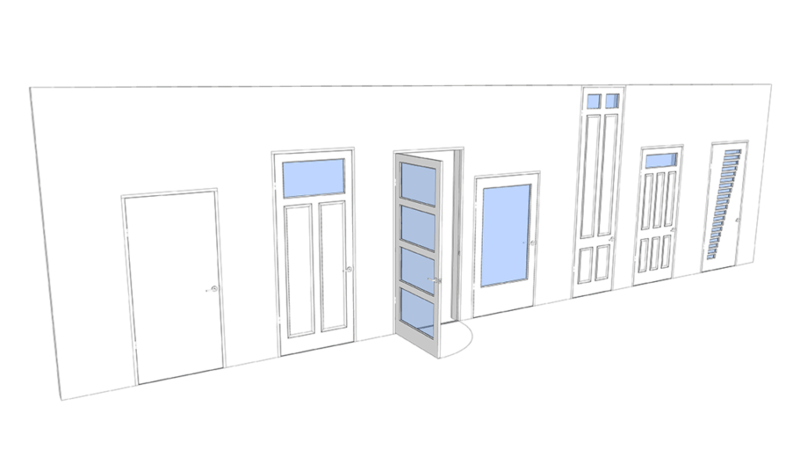 Note: In order to see section fills (Sketchup 2018) for this specific dynamic door panel, you will need to completely explode it's contents - Of course this will make it not so dynamic anymore. In the next post we'll show how to create your own customized dynamic doors by diving deep into the settings of the Multi Dynamic Door Panel.